Bib numbers were released for IM Canada! I’ll be number 2534. Track me on race day at http://www.ironman.com! Categories: IMCanada | Tags: RaceDay, Raceprep | Permalink. Just to get a better sense of what the conditions were like in Lake Placid two weeks ago – and how the best athletes were impacted – check out this video about the Pros at the race! Categories: IMLP | Tags: IMLP, pros, RaceDay | Permalink. Race Morning: I rolled out of bed at 4:45 am and ate my favorite pre-race meal of a peanut butter sandwich and a banana. For the first time all week, I felt nervous. While I told my friends and family that nobody needed to head down to transition with me, I was pretty psyched that they were all up and ready when I left at 5:30 am. I found some friends in transition, pumped up my bike tires, unwrapped my bike (thank for the tip about putting garbage bags over it the night before! ), and got my bodymarked. Then I walked down to drop off my special needs bags and get ready on the beach. Swim: I bumped into my friend Joe on the beach and we wandered over to the water together. I decided to seed myself towards the front and middle. No matter how many times you watch an Ironman swim start on You Tube, nothing will prepare you for the chaos of the mass start! The first two minutes felt like 20 as I struggled to get a spot where I could just stretch out and swim. Finally, I broke free – only to be clobbered in the nose. I was certain for the remainder of the first loop (and even later on the run when I bumped my nose with a cup of gatorade) that my nose was broken. I kept feeling for blood, but decided if I could breathe ok, I should just keep swimming. The second loop cleared out a bit – until we made the turn to head back in…and I got straight out dunked like my head was a basketball. I popped up screaming “What the hell man!” and was ready to fight until I realized nobody was paying attention – just swimming. So, back I went to concentrating on a nice long stroke. I exited the water in 1:06 and was psyched to see my crew of 10 in their yellow Team Stropedogg shirts lining the run from the beach to transition. Bike: After a little confusion in transition (turns out you need to go through the change tent even if you’re not changing), I was off on the very wet ride. Luckily, I was used to the rain from a training weekend in June. The first loop was pretty uneventful for me. My nutrition plan was solid – I packed plenty of gu, shot blocks, cliff bars – and a delicious peanut butter sandwich in my special needs bag. Coming down the big descent on the second loop, I was freezing thanks to the rain! Forget gatorade and water, I desperately wanted hot chocolate! Joe caught me on the second loop and it was great to have some company for a while. Also, the aid stations were fantastic! My favorite aid station was on Hassleback road – while I used the porta-potties, the volunteers filled up my water bottles and piled up food on my aero bars! 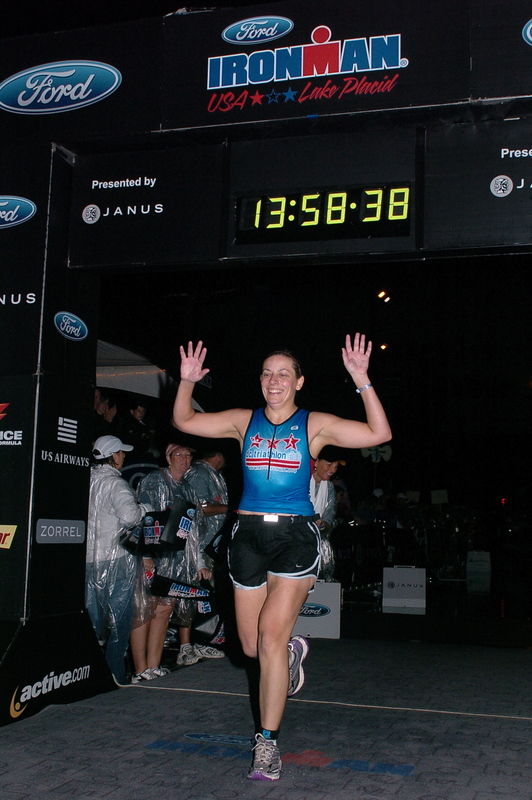 Run: What a fun first marathon – rain, rain, and more rain! I changed into my DC tri top – which made it really easy to be spotted. I saw Kip and Kevin on the way out of town. I ran with my friend Jim for the first three miles and saw Joe, Tom, Heather and a couple other tri club folks on the course. My run to each aid station and walk through the station strategy held up until about mile 19 – when I had to start tossing in a couple more walks. I passed Jim again on my way back into town and he gave me a huge hug, “You’re going to be an Ironwoman today!” I started my final two mile trudge up the hill into town. It was so great to see my friends and family as I climbed the final hill back into town. I stopped for photos and high-fives. The best part was hearing my two year old niece say, “what Aunt Sara doing now? Aunt Sara run! Evie too! Evie too!” Oh yeah, and with never-ending rain, I learned that body glide and vaseline just don’t hold up. Finish: I crossed the finish line in just under 14 hours with a smile on my face! I went home to shower, then returned to the stands to cheer the final participants in – what an amazing experience! Music was blasting, the stands were shaking, and it almost didn’t matter that I felt like puking every other minute. I wore my finisher t-shirt from that night all the way through Monday night! Categories: IMLP, Races | Tags: RaceDay | Permalink. Categories: IMLP, Races | Tags: IMLP, RaceDay | Permalink. Congratulations on making it this far! Many times the most challenging aspect of Ironman racing is merely making it through the training and arriving on the starting line in one piece. If you’ve made it this far, the battle is more than half over. As we watch athletes go through the usual waves of confidence and terror that precede an Ironman, we want to remind you of a few things which may or may not help you. Have you ever had that nervous excitement? How do you deal? Categories: FamilyFriendsFans, IMLP, Logistics | Tags: IMLP, RaceDay | Permalink. Looks like I’ll need to start my packing this weekend! Some friends prepped me about the special needs bags for the bike and run. But, I just received an email from the Community Fund about Race Bags – check out everything I’ll need below. It’s definitely a bit more involved than my other races! Good thing there’s an EMS outdoors store in Placid in case I forget anything! Besides the standard extra bike tubes, CO2 cartridges, reflective tape (for when it gets dark on the run) and a long sleeve shirt, any recommendations on what I should put in my special needs bag? There’s no doubt I’ll have pringles and fritos in there! What else might be a good little treat to keep me going? Dry Clothes Bag – this is used to put any clothes you may wear down to the race start and clothing you may want at the end of the race. You will drop this bag on your way to the swim start and it will be available at the finish. Swim to Bike Bag – this bag is for your bike helmet, shoes, sunglasses, clothing etc and anything else you will be putting on after you exit the swim and make the transition to the bike leg. This bag is checked in the day before the race at bike/gear bag check-in You will have access to this bag race morning should you forget anything. Bike to Run Bag – This is for your running shoes, socks, hat, clothing change etc or anything you may need for the run leg. This bag is also checked the day before at the bike/ gear bag check-in, and you will have access to it on race morning if you forget anything. Special Needs Bike – This is an optional use bag. Special needs for the bike is stationed at approximately 56 miles into the bike leg, right on Mirror Lake Drive, as you are completing the first loop of the bike course. You may use this option if there is anything special that you would like to pick-up at this point of the event. For example if you have a special drink mix that you would like to replenish, extra, back-up salt tablets, a spare tube or any other kind of comfort food/ item that you think-you may need or want and cannot get out on the course. DO NOT PLACE ANY VALUABLES INTO THIS BAG. We do try and return these bags to the transition area after the race BUT THERE IS NO GUARANTEE you will get them back. You will hand in this bag on race morning – you will have to make the walk down Mirror Lake Drive to drop this off. This is the same location as the drop for Run Special Needs. In addition we do have volunteers at this point on the bike course who will try and hand the bag off to you BUT be prepared to stop briefly if you really want to get your bag and it is busy. Special Needs Run – Like the bike this bag is handed in on race morning on Mirror Lake Drive. During the race you will have the opportunity to pick-up these bags as you head to the turnaround on Mirror Lake Drive at 13 miles. It is for anything special you may need as you make the turn to start the second loop of the run. Special foods, drinks, salt tablets or even perhaps a warm shirt for those of you that may be out on the course late into the evening. Once again we will try and return these to you BUT IT IS NOT GURANTEED. That’s a lot of stuff to prepare! Any tips or thoughts about what may be good to have? I think if I learned my lesson from Black Bear, some sunscreen and extra body glide will be a must! Categories: IMLP, Logistics | Tags: RaceDay, racetips | Permalink.